What is the Xecan Chemotherapy? Xecan Chemotherapy has been developed from the Xecan Radiotherapy solution. Therefore it includes the following four modules: Smart Reception, Smart Exam Room and Patient Tracking Whiteboards, Smart Medication Verification and Clinic Analytics Reporting. Since chemo clinics are much busier, effectively managing workflow and patient safety in a chemotherapy clinic is not an easy job. In today’s busy clinical environment, longer wait times and challenged work flow can frustrate the patient experience. Xecan’s smart Chemotherapy solution can significantly reduce patient wait-times, improve the patient experience, and boost clinical throughput by focusing uniquely on Chemotherapy Patient Waiting & Calling Whiteboards and Chemo Chair Management Whiteboards. While in the waiting area, patients will be able to view their individual waiting status on an airport style directory whiteboard. It is displayed in the order of the patient’s appointment time, so patients have a clear idea how long they are going to wait in the area. 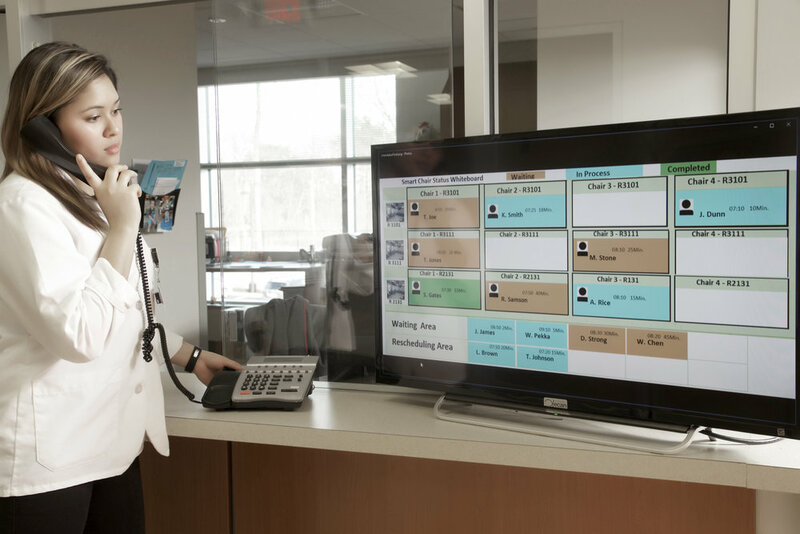 Once patients are ready to be treated, instead of looking for them in person as in existing clinics today, the clinical staff can notify them through the smart whiteboard by clicking on a patient’s abbreviated name with specific treatment room and chair number. With Xecan Chemotherapy, all of the chemo chair usage status information is displayed in real-time on a clinical Staff Whiteboard. By knowing the patient location and chair status in real time on the whiteboard, the clinical team knows which chairs are ready for new patients and which are still occupied. Such a high degree of accuracy in tracking and assignment ensures efficiency and the maximum quality of care. A staff member scans to update the chair status. Just prior to commencing drug administration, patient name and ID will be shown on a PC attached to the chair. When the nurse comes to administer the medication, he or she will first verify that the patient ID matches the ID on the chemo drugs together with specific setup notes. This verification, along with instructions, greatly improves patient safety and quality of care. In conclusion, the Xecan Chemotherapy is projected to reduce patient wait-time, and improve throughput by 50% with the same number of staff, with much improved patient safety and a more favorable patient experience.